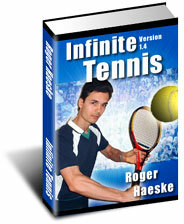 Tennis can be very easy to learn or very complicated and frustrating. Traditional teaching concepts sometimes make learning tennis a struggle. I'll give you a dramatic example from one of my own lessons. I was working with my student on improving his topspin backhand. After some observation I realized that he wasn't bending his knees while hitting his topspin backhand. I told him to bend his knees more and demonstrated a proper knee bend. But he was very awkward when trying to do it. His form was totally off and he had no clue as to how much and when to bend his knees. From much experience, I predicted that he would not be able to use the knee bend by me just telling him to bend his knees. Telling him to bend his knees is what I call and Instructor's Perspective Instruction. That instruction came from my observation of what was missing from his stroke. The only problem is that it is very hard to integrate this instruction to a natural way of hitting the tennis ball. What he needed was a Student Perspective Instruction. So I asked him and myself how we could find a natural or Student Perspective way to incorporate this technique into his stroke. No sooner had I asked the question and a minute later, we found the answer. I realized that if we made one minor change he was able to bend his knees in a natural and proper manner for every situation. The secret was to have him close his racquet face more. That means to have the side of the strings that are going to contact the ball to be facing in a downward direction. This is easily done by turning the grip. Within a few shots of turning the grip down, he was bending his knees naturally. Better yet, he was hitting great topspin backhands. All it took was a grip change and his own Inner-Mechanics gave him all the necessary feeling instructions to be able to do the complete shot. In short he did the complete shot well but it only took one instruction. The reason this worked is because a closed racquet face forces you to bend and swing up, otherwise the ball will go into the net. This grip change allowed him to use his subconscious mind to hit the shot. The previous tip to bend his knees made him focus on part of the stroke instead of the whole stroke. By making him change his grip and just try to get good results he was focusing on the whole shot. This made for instant learning instead of a frustrating attempt to make a change that could have taken days to achieve. To play your best find natural ways to incorporate techniques into your Tennis game. If you are really struggling, you are probably going about learning the wrong way. Ask yourself if there is a simple way to learn what you want to learn.